Make tidying up fun and easy with this excellent solution for storing away all those soft toys, blankets, and clothes while also doubling up as a fun and stylish bean bag. The stuffed animal storage organizer tote comes empty, beanless, and ready for all your stuffable items. Made of strong, durable and soft fabric which can withstand the rough and tumble day-to-day use of sitting or being jumped on, opened and closed, regular indoor use, its even cozy enough sleeping kids! Washing machine friendly, for the likely case of any accidental stains or mishaps! Our colorful and durable premium canvas cover features an easy to carry handle to allow small kids to use the storage bag all over the house, without leaving a trail of destruction behind! Comes in a classic black and white feather design. Unlike a smaller storage sack, our original bean bag chairs holds up to 50+ soft and fluffy toys, making it the prime and ideal option for young children, boys or girls.. This fun and practical gift is perfect for any birthday or holiday occasion. Our bean bags were created to inspire children to clean up after themselves, facilitating parent/child engagement, cultivating more creative quality time, and keeps your child's rooms clean. To provide whole quality products, that bring value and joy to you and your family. If you have any product issues or concerns please do not hesitate to contact us as soon as possible, we will try our best to solve any issues. Customer service by Cam & Kalleia. ► ► Click "ADD TO CART" above to get yours now! ✔️【FILL IT TO THE BRIM】- Our 27" Large bean bags can fit up to 50+ stuffed animals, can it fit more? Go ahead and try! Our non toxic bags are durable and strong enough for anything you throw in them...Okay nothing sharp and pointy, but for anything else it's a go! Remember anything hard might not be the most comfortable to sit on. No more need to tip toe around your kid's toys, just fill up your bean bag! ✔️【THE PERFECT GIFT】- Our Bean Bags are the perfect gift, why? Not only does it clear rooms but it also clears the mind! It's just bean bag science! Our bags have deep pockets perfect for holding game controllers, snacks, or your phone while you namaste relaxing. 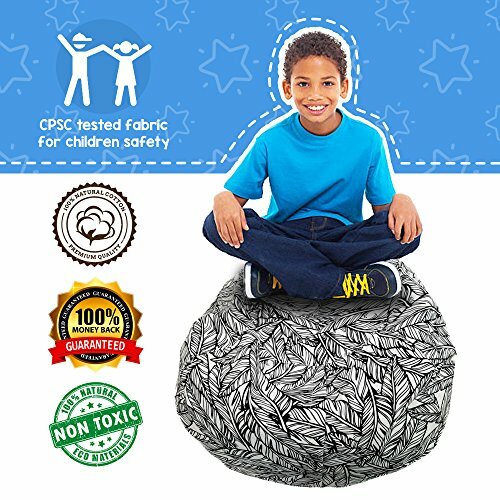 Gift a bean bag to your friends with the 6 kids, your neighbor with the mountain of clothes, your kid going off to college, or anyone who is a kid at heart! Comfort and Relaxation all in one large bean bag! ✔️【TIDY UP WITH STYLE】- You will not regret having your new kids toy storage bean bag displayed at home. Our bean bags are designed beautifully and handmade with detail to enhance your kids room decor and ensure they are not an eyesore to you and your guests. Fill up your kids storage bean bag with extra towels, clothes, stuffed toys, take it anywhere, and enjoy the comfiest chair in your home, office, or dorm! We all know at least one person who needs a creative way to clean their room! ✔️【HIGH QUALITY CONSTRUCTION】- We strive to ensure that your toy storage bean bags will last you through the ages with our Premium Quality Materials. Our canvas bag is DURABLE with the strongest cotton large canvas material and quality extra-long YKK zipper guaranteeing your zipper bags will NOT fray, zips EASY, and we DOUBLED the protection with double stitched seams, ensuring your large storage bags can be thrown, kicked, and dragged for years to come! No worries just Stuff, Fluff, and Plop! ✔️【LIFETIME WARRANTY】 - Cam & Kalleia is the premier seller of the exceptional canvas bean bag kids chair. We take pride in our products and you have our promise that if you are not absolutely in LOVE and thrilled with your kids bean bag we will give your money back. No questions asked, and no need to even return the product... no joking! ...what are you waiting for?! Click "Add to Cart" and get yours now! If you have any questions about this product by Cam & Kalleia, contact us by completing and submitting the form below. If you are looking for a specif part number, please include it with your message.